I've been roving for over 23 years. 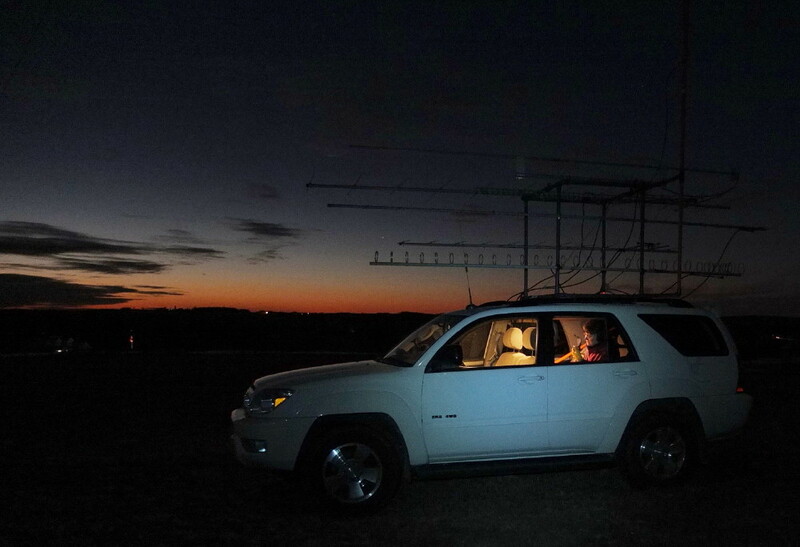 I rove for most January VHF Contests, however, I take an occasional contest off to take a break from the cold. Over the years, I've seen bitter cold of -18 degrees to foggy January thaws. During the past year I had a big change to my life--I now have a girlfriend! She is Janice, KA9VVQ. We have many shared interests outside of ham radio. But ham radio is certainly a shared interest. She's heard me describe my roves and she saw the rovermobile at Field Day--and she still was interested!!!! On one hand, we could have skipped the January VHF contest. But Janice knew I was interested in getting back on the air and asked if I was planning on roving if she could join me. Cool! I figured that if we roved along the 88th Meridian in eastern Wisconsin, there would be plenty of QSO volume and logistics of meeting up with Janice would be much easier. Most years I plan 8 grid roves and this year was no different. I came up with a plan that would have us do EN62, EN52, and EN53 on Saturday and EN63, EN54, EN64, EN55, and EN65 on Sunday. We would get lodging on Sunday night in northern Wisconsin and return to the Milwaukee area on Monday. Here is the special QSL card we will send out this year. I make a small "limited edition". Let me know if you'd like one for your collection. This picture is taken in EN64. 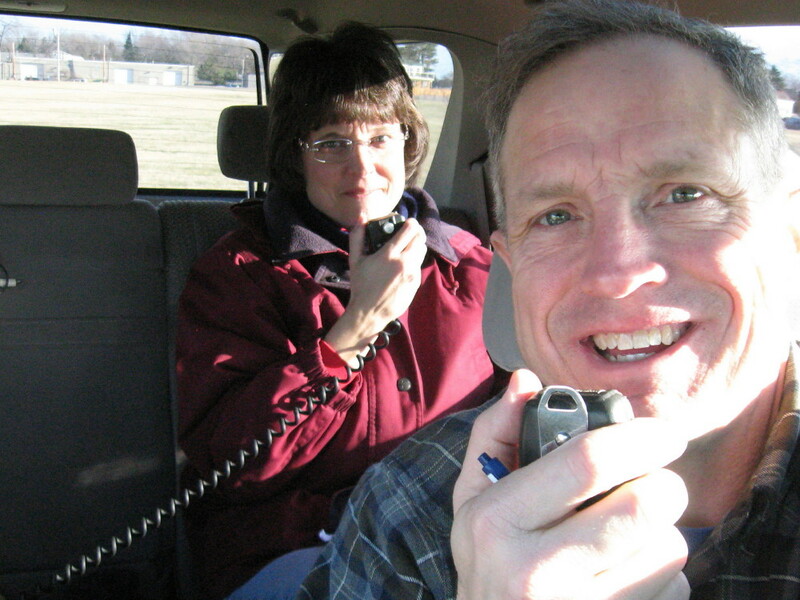 We whipped off of I-43 and practiced picking a viable VHF location on short notice. I have a spot out west of Valders, WI that is near the grid-corner that I like to use. But that was about 20 miles away. Time was running short--so what could we do closer and quicker? I had Janice look at the DeLorme map book and gave her some hints on things I look for on the map that might yield worthwhile operating locations. Water towers and radio towers are hopeful indicators. This watertower and industrial park in SW Manitowoc worked out well for us. Once we were done, we could get back on I-43 northbound with ease. Temp was about 10 degrees with windchill -5 degrees. I loaded the radios in my garage up in the Twin Cities on Thursday. It was COLD in the garage on my knees routing wires and cables. Unfortunately, I plugged the 1296 rig in backwards and it blew the main 60amp fuse and a fuse internal to the 1296 rig. I spent about 2 hours opening up the 1296 rig and replaced the soldered in fuse. Now it powered up and I assumed all was fine. I drove to the farm for a night. I got the antenna rack out of the barn and it was an easier year than normal in that there was no snow build-up in front of that rarely used barn door. And the temps were very nice. We started the contest in EN62. I like a spot just north of the Milwaukee Airport. In this photo, you can see the control tower. We got in position with enough time to eat a sandwich and talk about how we work our way through the bands on five or six different radios. The temperature was mild in the mid-thirties at the start of the contest. But the wind chill was unpleasant on account of the wind--a steady 15 mph wind. It was nice to be inside the vehicle. The only time we both transmitted was when I was checking FM in the Milwaukee area. There were about 5 FM Q's per grid in the Milw area. At this location, the 1296 rig had a noise level of S8. I assumed the source was local and that things would be better in the next grid. We operated 6,2,222,432,902,2304, and 10 GHz. Our 2nd location was in New Berlin, WI on National Ave for EN52. The winds subsided somewhat. This was probably the most pleasant location weather-wise. Here, I finally figured out that the 1296 rig was damaged and not working. The S8 noise was still present. Our third location was Hillcrest Park in Waukesha, WI for EN53. This is a great location. After a sit-down dinner break at Culver's, we arrived in the dark at the site. The temps were dropping fast and the winds were picking up. As a result, the windchill was getting very annoying. Near 9pm, the winds were howling and rocking the car. I feared the little fiberglass pole holding up the 6m dipole would snap. 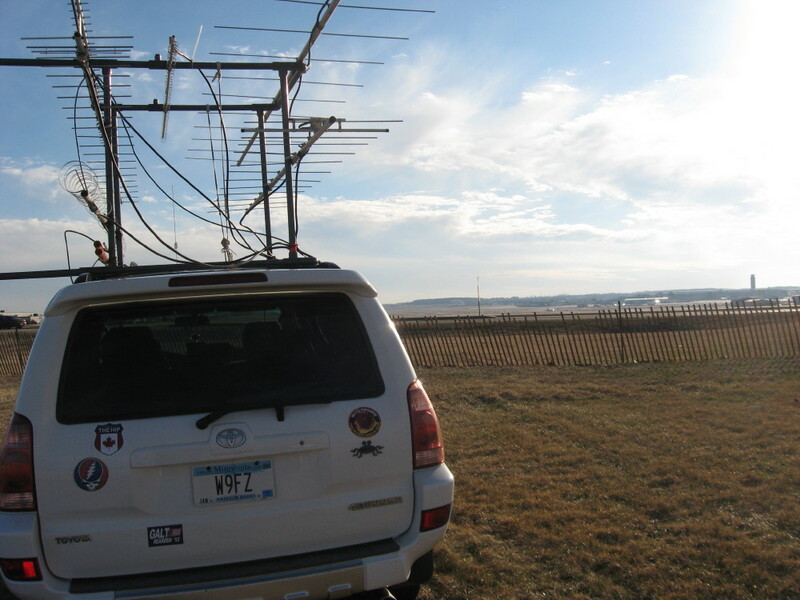 While at this location, Jerry WA9O roved to EN52 and EN53 with a few bands. The highlight was working Jerry on 10 GHz in both grids. Sure, the distances weren't very great, but it was nice to see that my system worked after not having been used since September. And the frequency locking to an OCXO worked fine--I was right on Jerry's freq when I turned it on. As we left EN53, temps were dropping into the 20s and supposed to be in the single digits by dawn Sunday. Sunday morning, my original plan was to be on the air from EN63 at 8am. Janice and I looked out the window to see high winds and the thermometer said about 5 degrees. So we decided to scrap our plans and stay indoors--at least for the present. After a couple of hours, the winds let up a bit and we decided to go out and take it one grid at a time. The wind and wind chill had the potential to make it a VERY unpleasant day to be out. We arrived at EN63 about 3 hours behind our original schedule. Ken W9GA did a great job keeping other ops informed why we weren't on the air. I talked with Ken while driving and he encouraged us to skip EN54 and EN64 but still scoot up to EN55 and EN65 because those two grids sure would be helpful to the local ops. I said we'd take it one grid at a time but that was probably a good compromise to try and get back on schedule. We departed EN63 headed northward. We activated EN64 afterall. It just was too easy. So we skipped EN54. Gary ND9Z has almost all of the bands 2304 and below so the grid was well represented by him. After EN64 we made it to EN55. Now we were almost back on schedule. Our last location was in EN65. These last two grids seemed to be helpful to fixed stations scores. I want to compliment fixed stations like W9GA, KC9BQA, and W9RM. Not only did they keep tabs by checking on us, they also helped drum up extra business for us by making calls down their way alerting other Ops to our presence. 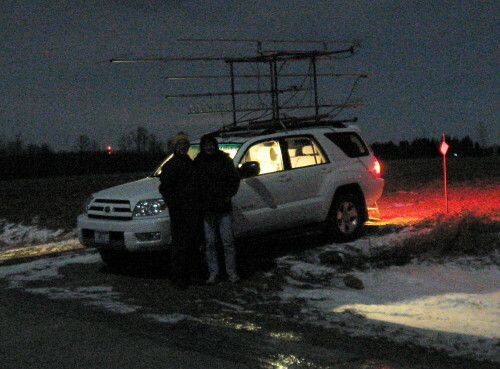 They also let us know there were some long distance ops down in central Indiana hearing us and really needed the grid. We pointed that way and were successful in a couple of cases and not in a few others. Here Janice is operating from EN55. We found a new location west of Pound, WI near a tower site. This was a big improvement over the past few sites I've tried in that area for EN55. It was a pretty sunset and we took some pictures before getting on the air from here. The moon was out. In general, conditions were below average and poor. We never worked the Twin Cities. Only W0UC and N0AKC made it into the log from out that way. We never got any 6-meter opening. By Sunday evening, conditions improved to average. It was a beautiful sunset in EN55. Trapped in the backseat of a rovermobile and this is fun? I'm so proud of Janice and how quickly she learned how to carry the operators through the bands. 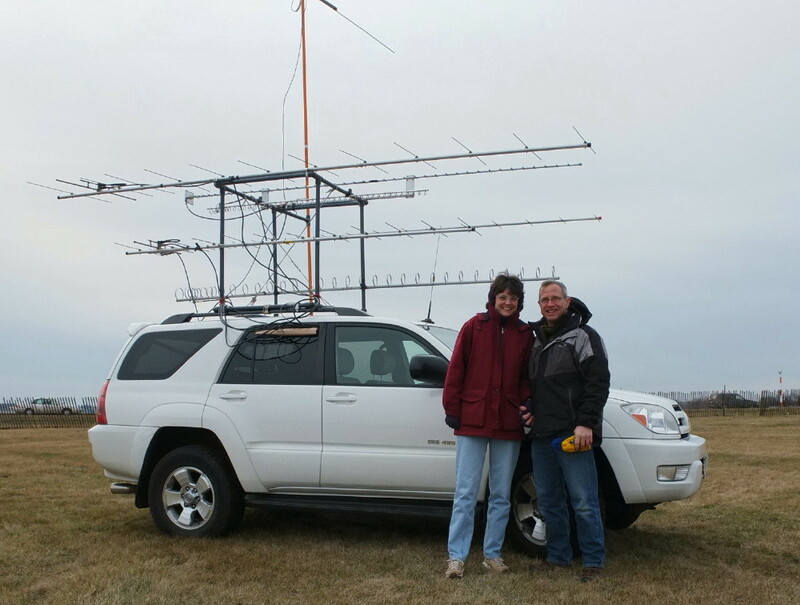 I marvelled at how she took W9GA, KC9BQA, W9RM, N9LB, and N9DG through the bands on her first contest. This is in EN65 after the contest is over. It's about an 8 second exposure. We held still :-). This was just after 10pm. 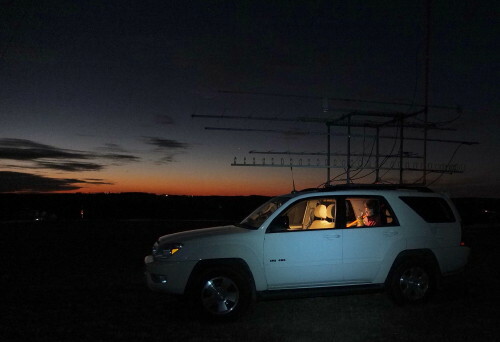 As a rover, after the contest is over, there is this satisfied feeling while taking down the 6m antenna and packing up while out in the middle of nowhere. Once packed up, we motored to Menomonee, MI and stayed at an Amercinn there. We drove back to Milwaukee on Monday. It was still cold and windy out of the west during our drive southward. But it was a nice sunny day for a drive. On all my past roves, the radios and amplifiers have been in and around the front passenger seat. Now that I have a 2nd operator, that would not do. While traveling, the other operator needs to be in the passenger seat. Operating from the back seat is acceptable but only barely so. I moved the radio table to the rear passenger seat. I had to cram the amplifiers even closer than previously. This time I had more RF feedback than previously and on more radios. In the past, only 222 and 6 meters were plagued by RF feedback. This time 432 was also effected. The BIG wind on Saturday night caused an intermittent to appear on the 6m dipole. We had annoying intermittent cut-outs of signal. We switched to a mag-mount "Hamstick" stuck to the side of the car at a 45 degree angle. 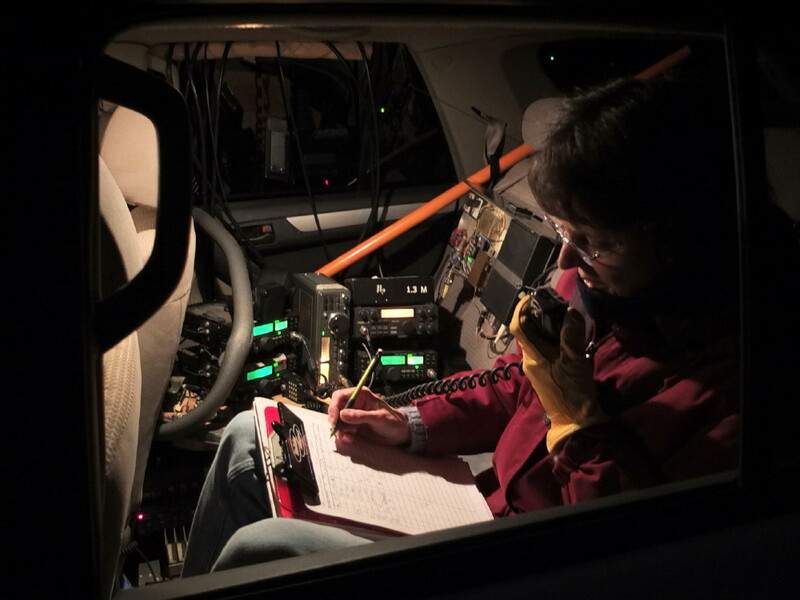 I'm sure we were even weaker than normal, but Operators were still able to work us on 6m! I have layout changes planned. I will rebuild the 6m dipole and build up a 6m Moxon. A more complex problem is how to remove the back seat on the Toyota 4-Runner so the radio operator can sit sideways at the radio table. This first event for us as a team was a great success. 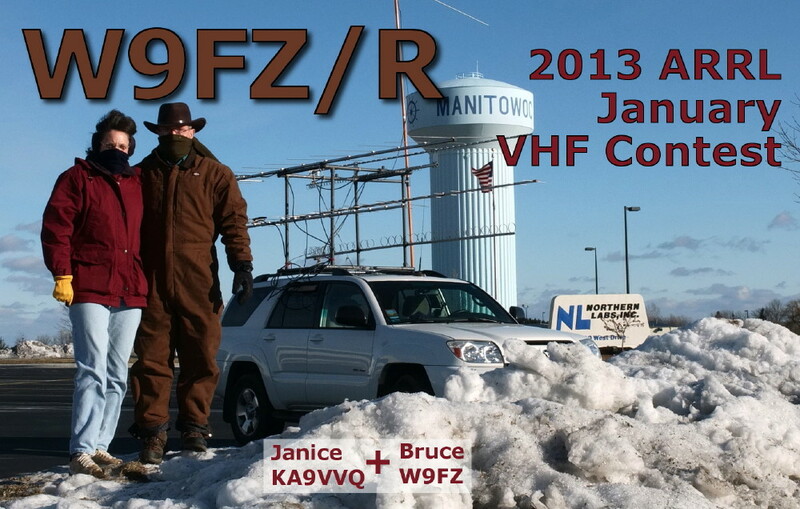 Janice seems to like VHF/UHF but recognizes that it is challenging. We are discussing changes in layout to decrease RF feedback and make things simpler. I REALLY enjoyed having Janice with me on this jaunt--it was a joy to share it with her. 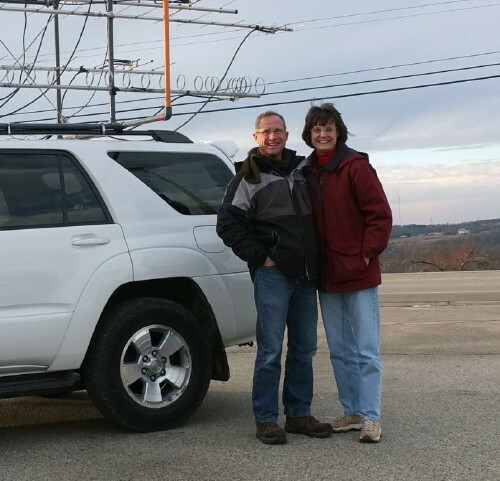 We got the joys beyond ham radio such as scenery and travel.